Thank you for so much fun, ladies! 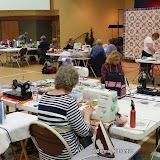 We had a great time making a TON of units needed for the Jamestown Landing quilt everyone has dancing in their dreams…making the dream a reality with a simple start. Yes, there may be over 800 half square triangles, but the use of simple strips and the Easy Angle ruler mean those triangles take less time to create. I told the ladies…DO NOT COUNT! just cut and sew. You’ll see how much you’ve done, concentrate on the progress, not on how much is yet to go. STOP COUNTING THE PIECES and intimidating yourself when it comes to a big project. Just sew! These seams are less than 2.5” long. You can sew a whole lot of 2.5” seams in a very short amount of time if things are cut correctly and sewn correctly so there is little to know sliver trimming down. Love of the Blue & White! And some orange and grey! Check out the cat pin cushion! He ate my pins! Ha! I spent last night at a DFW airport hotel…6am shuttle will get time to the airport on time for my flight to Phoenix. Dinner was my last chance attempt at Texas BBQ and we succeeded! SO good! I satisfied my craving with a brisket stuffed baked potato with all of the fixins’ Mmmmm MMmmm Texas GOOD! Catch you from Phoenix, everyone --- Hexies all the way! "STOP COUNTING THE PIECES and intimidating yourself when it comes to a big project. Just sew!" You've probably been saying this in some form or another for years because you conveyed this thought it to someone at dinner a few years ago when you were here in Ohio. It wasn't my question you were answering, but I never forgot that. Ever since, I almost always make too many pieces, but I have learned to add them to the back to use them up and the freedom it brings to sewing a large project is incredible! Hard Eight - LOVE IT love it love it, did I tell you I love that place! The food is delicious and the building speaks Texan all the way. It's one of those places that needs a bigger parking lot. That does it, those blocks in red ROCK! I have been undecided about a red and white quilt for so long...pretty sure this is the one I am doing in red and white! Gonna at least start it this year, lol! 3 more borders to get on Grand Illusion before tomorrow morning's workshop..one more sleep! I am starting to cut my fabrics and collect up everything to make this quilt. It so reminds me of the ocean and the sand. I have wanted to do Jamestown Landing ever since I saw you demonstrate it on the Quilt Show. I agree about the red blocks! Where can we find this pattern? It's being added to my "must make" list! Happy quilting!! Amen to Paul's comment! I've been following your Blog for several years & love the encouragement I always get from you. I'm in the process of working on a big project with lots of pieces & was definitely discouraged until I saw this post. I have been so productive today because I just sewed and didn't count. Liberating!!!!! Thank you. Hexies all the way --- you are a hoot!